There is a growing demand in the urban living market for high-rise developments to incorprate outdoor living spaces within their properties. The installation of paver pedestal systems is a functional economical solution that allows just that! The pedestal system typically stands on top of a concrete topping slab and the roof’s waterproofing membrane and insulation. 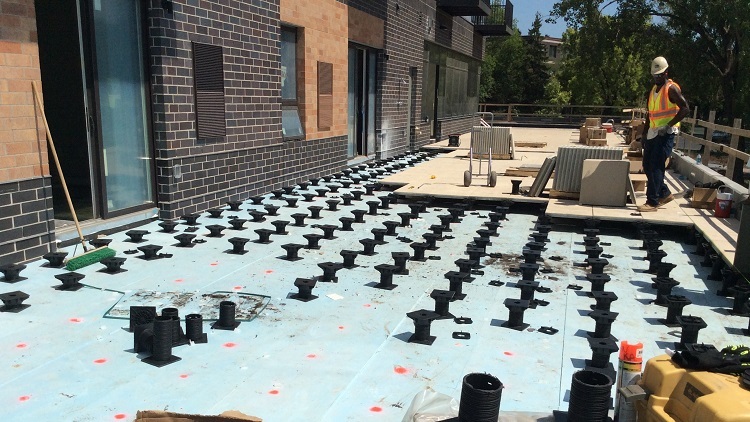 The use of this system allows storm water to flow freely through the paver joints and down to the building’s roof drainage system. The concrete topping slab is pitched to take care of the water drainage, while the pedestals stand vertical with a perfectly flat patio elevation. In some situations, the pavers can be recessed to allow for the installation of artificial turf areas.